Martino has a long standing friendship and over 25 years of collaboration with Czech cellist Daniel Veis. Together they have toured widely and their recordings include the complete works of Mendelssohn for piano and cello. For more details visit www.rosamundetrio.com. 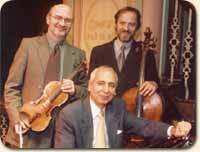 In 2002, Martino and Daniel, together with violinist Ben Sayevich, formed the Rosamunde Trio and have since concertised in the United Kingdom, USA, Ireland, Slovenia, Germany, Italy, Cyprus and Czech Republic. Their recordings of the Shostakovich & Tchaikovsky Piano Trios and Dvorak Piano Trios are now available on the Alto label. In November 2011 the Rosamunde Trio collaborated with DanceCyprus in a series of performances with music by Schubert and Smetana. This unusual combination of dance with music for piano trio proved an enormous success and further performances in several countries are now being planned. In 2012 the Rosamunde Trio celebrated its 10th anniversary with several performances of the complete Trios of Beethoven, including one at London's Kings Place. Following the enormous success of these concerts the Trio has now embarked on an even bigger series for the London Chamber Music Society, entitled 'Mozart and the French School', and this will continue well into 2017. It will include all the Mozart Trios and the great French Trios and Quartets. For many years Martino has supported and guided pianists of a wide range of abilities, from amateurs to brilliant young professionals. Twelve of his students have won 1st prizes at international competitions. He has given masterclasses all over the world including at Tel-Hai (Israel), Eastman School of Music (USA), Dartington International Summer School, Chetham's Summer School (Manchester), RAM (London), RSAMD (Glasgow) and at numerous other top music academies and colleges in the UK, USA, Canada, Germany, Denmark, Finland, Norway, Greece, Spain, Portugal, Ireland, Serbia, South Africa and China. Competition adjudication includes the London International Piano Competition, Manchester International Concerto Competition and the Maria Callas International Grand Prix.